Statist regulations. Quackery. Addiction. These are the modern symptoms of a disease that has infected Western medicine for thousands of years: the disease of humanism. In a series of thirteen "Medical Reports," R. J. Rushdoony traced the Christian and pagan roots of Western medicine in history, and demonstrated how humanist thought has produced vicious fruit in both modern medical practices and in the expectations of patients. How do we heal the medical profession? Rushdoony understood that finger-pointing will not solve our problems. Because the plague of humanism will inevitably lead to death and no wellness, it is the responsibility of the Church - and the Christian medical professionals with her - to develop a thoroughly Biblical theology of medicine and to teach it. 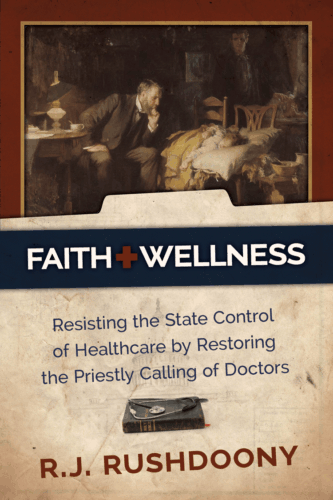 Rushdoony lays foundations for this by explaining the connection between salvation and healing, establishing the vital importance of treating the whole man (body and spirit), and renewing the vision for doctors to embrace their priestly callings. This is an essential read for anyone who wants to reform health care. This paperback books includes all the Medical Reports once part of the Roots of Reconstruction.